It seems appropriate this time of the year to be talking about cars. In London, pollution from particulates generated by motor-vehicles have contributed to a dangerous smog that have invited comparisons to Beijing. Here in NZ we have February set up as a biking challenge. I’ve commuted by bike every workday so far. I may go the whole month this way. 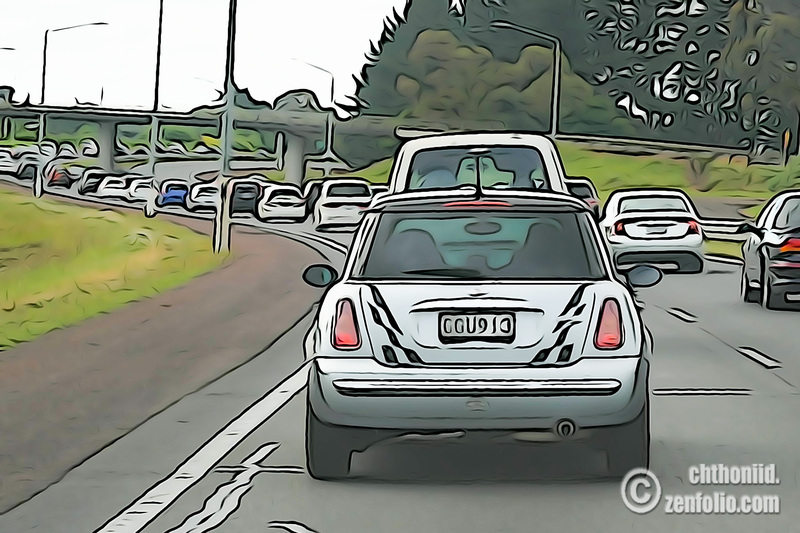 Road-congestion however, has become an expected part of life in Auckland. Part of that is accepting the increase in emissions that come from cars. Some days I can look from Lonely Track Road on the Shore, toward Auckland at rush hour, and now see a dark blur of pollution hanging over the CBD. That wasn’t there 10 years ago. Pollution: What went wrong in London? The short answer is Kyoto. Diesel-fueled cars produce less carbon dioxide than petrol-fueled cars. If the composition of the car fleet shifted to have a bigger proportion of diesel cars, than Greenhouse gas (GHG) emissions would fall in aggregate. By the late 1990s many European countries decided to go that route. The UK cut the tax (duty) on diesel. The problem is diesel engines produce more particulates (the minute, dirty particles that obscure the air and give people lung diseases). A policy to solve a global problem (climate change) made a local problem (air-quality in London) worse. And progressively worse as motorists bought more and more diesel-fueled cars. Unintended consequences are the bane of many regulatory policies. It didn’t help that manufacturing standards on diesel emissions were not adhered to when VW found it easier to cheat on the tests than adhere to them. Anyway, London illustrates some of the problems with internal-combustion-engine cars. They all produce pollution. The effect of this pollution moves around and it depends on time and location. The environmental cost of a car being driven at peak times in the middle of a city, is different to one driven on uncongested roads in rural areas. In congested roads, fuel economy drops (while emissions rise), travel time increases, roads have to be maintained and repaired more frequently. What Makes Cars Harder to Manage? Basically, the problem is they move. A lot of regulatory policy is based on reducing emissions from sources that don’t move. Factories and farms are good at staying at in one place. Cars don’t. Cars move around and they create pollution hot-spots as they cluster. Not only do they create these emission problems, but the congestion costs start to inflate as density rises. We also provide all kinds of implicit subsidies to car owners to drive cars. Motorists can park for free on many streets. Road construction and maintenance is imperfectly (especially urban roads) met by car-owners. What motorists pay is not strictly based on their use. The costs imposed on other motorists (longer travel time, exposure to emissions) aren’t met by drivers. Roads are primarily designed for motorists and expediting their movement. Other road users are not given the same priority. This is not to say motorists don’t pay some of these costs. The point is that some of the costs are shifted onto others, and this acts as a subsidy for drivers. Some countries use toll roads and added congestion fees to manage cars. This is not politically palatable in New Zealand (albeit would be more efficient). So like many countries, we try to fix the pollution problem by regulating the technology in the car. The biggest problem with this approach is that it takes a long time for improved technology to filter through the car fleet. If everybody brought a new car every year, improved emissions technology would rapidly go through the car fleet. We of course don’t. In fact in New Zealand we are very good at holding on to older cars and not buying newer ones. We get stuck with higher emissions for years. I wonder how many people participated in the February “Go By Bike Day” on the 8th? Just a quick stock take of my campus shows that 19 out of 550 of us are registered for the February bike challenge. 60 commutes have been registered. 18 of those trips are mine. 27% of the CO2 savings generated by Massey (Albany) have come from me. This seems to be an apt illustration of the dilemma. We can’t keep adding more and more cars to the road network without increased emissions and congestion. Bicycles have to become part of the solution if we want lower emissions. It is however, very difficult to get people out of cars on to bicycles. Now there may be many people who for whatever reason need cars. But the very low use of bicycles, even where I work that has access to showers, bike racks etc, shows that necessity isn’t what is discouraging cyclists. Cycling is perceived as a dangerous form of transport. And it currently is. The daily commutes almost always involve a number of ‘non-injury’ incidents. Cars overtake too closely. They block you by moving into cycle lanes. They’ll pull out in front of you at roundabouts or intersections. Recent research from the UK shows these have impacts on cyclists (Aldred, 2016). It can prompt cyclists to take longer routes (I have several I prefer over more direct routes at high-risk times of the day) or cycle less often. Or take more defensive measures. Interestingly, cyclist perceptions of risks and who is at fault, aligns reasonably well with Police analysis (Alred, 2016). That confirms that blame is not equally shared between cyclists and motorists. Rather, in the significant majority of injury-cases, motorists are at fault. Cyclists are actually as a group, have a good understanding of the risks of commuting by bike. Perhaps we have a greater incentive to be so aware. Reducing those risks means two things. First, improving the bicycle infrastructure. Money spent to benefit cyclists, does benefit motorists as well. There’s less cars on the road for remaining car users. Second, some motorists need to be a more considerate of cyclists. I have no great problem with most of the motorists I share the road with. But there’s a lot of scope for improvement for a few of them. I haven’t been closely following vehicle emissions research, but I thought that visible haze usually precluded the formation of highly toxic nanoparticles, as the larger particles provide condensation surfaces?. The vast majority of NZ vehicles are petrol fueled, whereas particulate formation is much more a problem arising from diesel. In a calendar year, just 15 of the world’s largest class of container ships emit the same quantity of suphur oxides as all of the petrol-powered cars ( 760 million ). Changing shipping fuels from residual crude oil hydrocarbons to low sulphur distillate hydrocarbons would greatly reduce toxic particulate emissions, especially in port cities. Petrol taxes are a greater contributor to the $2 billion government revenue ( ~70% ) from roads, even though cars cause much less damage to roads. The AA was campaigning that diesels don’t pay their share via Road User Charges. I don’t think the AA has yet demanded that cyclists should also pay their way. The obvious solutions are to increase petrol engine efficiency ( eg turbulent jet ignition as used in Formula 1 ), reduce vehicle mass, improve road and vehicle safety ( autonomous driving, anti-intrusion skirts on large trucks ), reduce vehicle congestion, transfer to alternative motive power ( eg electric ). The relatively high number of motor cycle accidents would indicate that 3-4 wheels should be preferred to 2 wheels. yes, particulates are more of a problem with diesel engines (but petrol engines are not immune). That is one of the factors behind the London pollution problem. They experienced an increase over time in the percentage of diesel-fueled cars. Note that Central Government does not have the sole responsibility for roads in NZ. Some fees (vehicle licencing for instance) are not related to the distance traveled. This is duplicated where urban authorities use rates for roading projects. And damage to roads is not the only social cost of car ownership. Congestion is another issue, and one with commercial impacts as well. To reiterate., the point is not that motorists don’t meet some of these costs. It’s that they’re *imperfectly* met. The solution you provide I’m afraid is not obvious. You’re neglecting the point that these technological improvements take time to filter through the car fleet. The average age of a car in the NZ car fleet is 14 years. For trucks its closer to 18 years. This is the problem when you depend on technology to deal with emissions from cars. Yes, we can make cars much more efficient in terms of emissions. We just won’t see the benefits of that for quite a few years. The dynamic we currently have is that humans populations are growing, and car ownership rates are growing even faster. It’s hard to see how congestion can be tackled without the use of either economic instruments (tolls, especially in congested routes) or more people shifting to other transport means. For various reasons, NZ governments decided not to require vehicle technologies ( such as exhaust catalysts, on-board diagnostics, etc ), or fuel improvements ( low sulphur, reformulation, lower final boiling points ) for decades, but other nations been able to greatly reduce vehicle pollution. Until recently, it was normal for emissions equipment to be removed from second-hand imports. Now we require imports to comply with Japan’s 2005 regulations. NZ could be more stringent, but imports would be more expensive. Wind has been the accepted NZ solution for decades. With regard to congestion, newer vehicles can partially address emissions ( EVs, stop/start and cylinder deactivation ), however other strategies ( public transport, multiple occupancy ) require incentives to compensate for the loss of flexibility that drivers feel. In reality, older vehicle owners tolerate congestion, however younger people may decide to bypass vehicle ownership – provided they can reach destinations at a reasonable cost and time penalty. Congestion exists only because we have decided to centralise activities. Incentives to move employment locations would be beneficial. Mobile phones and the Internet should create options, as companies and government don’t need to be in a row of adjacent multi-story buildings. The future is electric, this year is the year many more car manufacturers are bringing out more electric vehicles. Hyundai for example is bringing out an EV. Electric vehicles produce no emissions, are faster off the mark and a smarter move for people looking to the future..
Elon Musk is a man who is changing the world with his “Tesla” car company, prior to his initiatives the electric car was not going to get off the ground. A good documentary for those interested in the politics of electric vehicles is “Who killed the electric car “. Bicycles are great but not practical for everyone, the future is electric. While I appreciate people do get enthusiastic about technological solutions, there’s still two problems. First, is just the time it takes for new technology to filter through the car fleet. This is too slow to materially reduce emissions in the short run. The second is the cost of emissions and congestion aren’t evenly distributed. Technology becomes a very expensive solution when say, on rural roads, we don’t have these problems. Electric cars also require a lot of resources to manufacture relative to bicycles. If the electricity that charges them is generated by coal or natural gas plants, then emissions tend just to be moved elsewhere. That may be less of an issue in NZ, but still needs to be considered. Bicycles (and walking) are pretty hard to beat in terms of emissions and congestion by any kind of motor vehicle.